We’re already fans of Ecotronic battery-free toys, (remember the adorable Eco-friendly Handpump Penguin Night Light)? Now there’s even more to love. Ecotronic has a new Eco Rocket available, which is an ultra cool toy for green, outer space loving kids. Kids charge up the Eco Rocket via its hand crank, and listen to a countdown as they watch the launchers power up. They can then actually see the rocket blast off! Battery-free flashing lights and sounds are included, and the hand crank stores neatly inside the rocket body. Ecotronic also uses biodegradable packaging with no dangerous ties or wires. Previously, Ecotronics had mainly been available from UK shops, but now Canadian based Raspberry Kids is carrying the Ecotronic line as well. We're already fans of Ecotronic battery-free toys, (remember the adorable Eco-friendly Handpump Penguin Night Light)? Now there's even more to love. 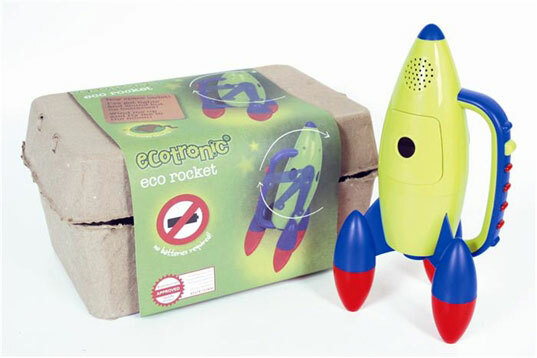 Ecotronic has a new Eco Rocket available, which is an ultra cool toy for green, outer space loving kids. Kids charge up the Eco Rocket via its hand crank, and listen to a countdown as they watch the launchers power up. They can then actually see the rocket blast off! Battery-free flashing lights and sounds are included, and the hand crank stores neatly inside the rocket body. Ecotronic also uses biodegradable packaging with no dangerous ties or wires. Previously, Ecotronics had mainly been available from UK shops, but now Canadian based Raspberry Kids is carrying the Ecotronic line as well.